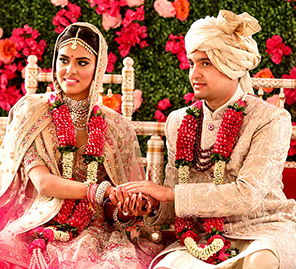 Hrishitaa Bhatt and Anand Tiwari had a hush-hush wedding in the capital this year. 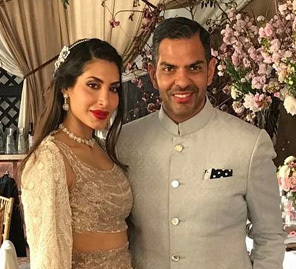 Actress Hrishitaa Bhatt, known for her stellar performances in films such as Asoka and Haasil, married her longtime beau, UN Diplomat Anand Tiwari in a private wedding ceremony in Delhi this year. 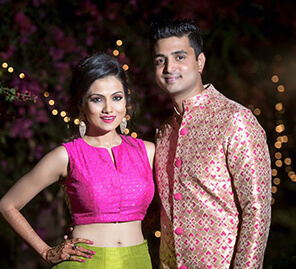 The close-knit wedding started with simple pre-wedding celebrations at Hrishitaa’s home in Mumbai. First, there was a roka or engagement ceremony. The actress was resplendent in a pink anarkali by Malvika Bajaj and make up by Ajay Bisht. The mehndi commenced soon after. With only her nearest and dearest present, the actress gleamed like a spring bride in a bright blue ensemble accessorized with floral jewellery by Floral Art. 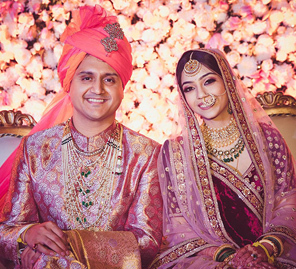 The cosy celebrations continued to the wedding day when Hrishitaa emerged looking every inch the royal bride in a bright red and gold lehenga with heavy zardozi embellishments specially designed by her friend, Preeti Singhal. She accessorized her outfit with an exquisite necklace, mathha patti and nath from Raabta by Rahul. Her makeup artist, Meenakshi Dutt, crafted an immaculate bronzed look that brought out her sharp features. Five days after the wedding celebrations, the gorgeous actress and her suave diplomat husband hosted a grand reception in Delhi to which she wore a neon pink and purple gown by designer Preeti Singhal, accessorized with stunning pearl shoulder jewellery and a choker necklace by Raabta by Rahul. The couple continued the celebrations with a lavish party in Mumbai as well.